However, soon it was put on display much less frequently. In 1844 half a million pilgrims gathered to visit the tunic, in 1891 one million, and in 1933 more than two millions. In 1959 the tunic was put on display above the high altar from 19th July to 20th September, in which period it was seen by 1, 8 million pilgrims. Most likely, the tunic in Trier is not the tunic actually worn by Christ. However, the question of authenticity regarding relics is not straightforward historical or scientific, or more precisely put: a pilgrimage is not primarily judged according to the authenticity of its object, but according to the authenticity of the devotion, which the object is instrumental in creating, and which is expressed by pilgrims. This contribution on the part of the devout makes the object, and the entire phenomenon of that particular pilgrimage, a testimony of the presence of God, the tunic linking the human response, specific in terms of time and place, to the eternal offering of Divine love. This thought is somewhat differently formulated in the current (November 2006) web site of the diocese of Trier: “Unabhängig von der Frage der “materiellen Echtheit” kann aber festgehalten werden: Christen haben 800 Jahre lang die “Tunika Christi” in Trier verehrt – als Zeichen für die Gegenwart des Mensch gewordenen Gottes in Jesus von Nazaret. Das steht historisch fest – und diese “spirituelle Echtheit” ist sicher wichtiger als jede Antwort auf die Frage: “Ist er denn eigentlich echt?”. It was always a basic Christian experience that “the holy” has not been distributed evenly among all times and places. Instead it has pleased God to have “points of special density of holiness” attached to certain places and certain times, in order that Christians may be better aware of it, and experience the presence of holiness more intensely. Basically, this notion stems from the concept of incarnation, the unique and unsurpassed point, every holy place or person, every liturgical time, display aspects or dimensions of that original phenomenon. 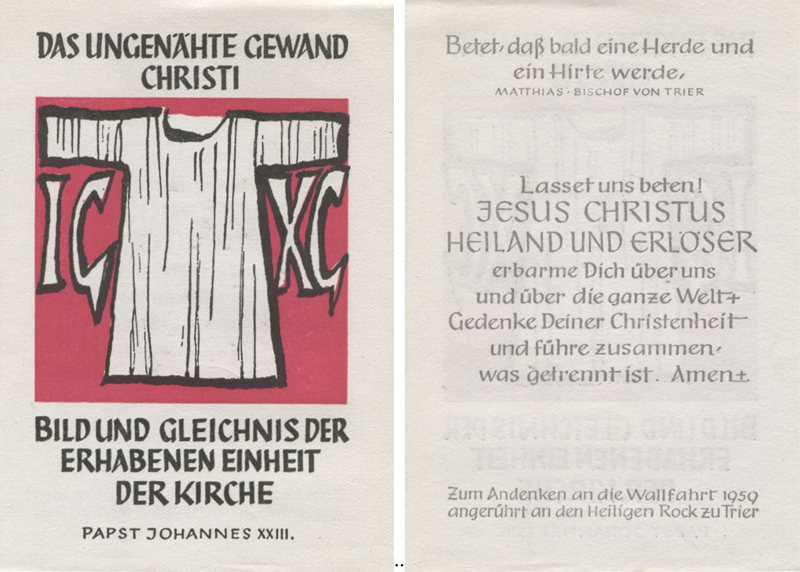 The holy card, measuring 115 x 80 mm; its texts written in the typical calligraphic style of the 1950s, was sold to pilgrims in connection with the display of the Sacred tunic in Trier in 1959, between the 19th July and 20th September that year. The object itself, quite stylized, is represented as a symbol of the unity of the Church, as testified to by Pope John XXIII. The point is not a historical truth as to its origins, but the contemporary use of it as a symbolic object, giving the pilgrimage and the devotion a spiritual meaning based on the description in the Passion of Christ: woven in one piece without seams. 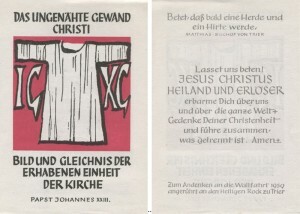 On the backside the Trier bishop at the time, Matthias Wehr (1951-66) exhorts the owner of the card to pray for the restoration of ecclesial unity, by mentioning one Pastor (which obviously cannot mean Christ Himself) implying as it were, a return to mother Church under Peter. Never the less, the card expresses the ecumenical spirit which had its major breakthrough at Vatican II only a few years later.